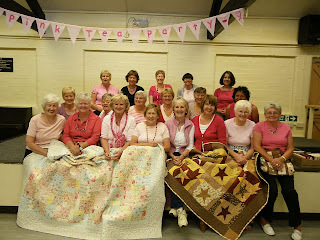 As you can see on our calendar the Beehive club meet on 1st and 3rd wednesday on the month between September and July. The club have got two special upcoming events that are open to whoever wishes to come along. On 4th July, there is a trip to the Welsh Quilt centre in Lampeter, there are very few places left on the coach, so please contact Sue quickly to reserve your place. Then on 18th July there will the annual Pink Tea party in aid of Breast Cancer research, stating at 1.30pm in Duffryn Community Centre. Members of the group have been making a range of beautiful bags that you will be able to purchase alongside a raffle, tombola, and all the tea, coffee and cake you could want. It's always a great event with lots of laughter, hope to see you there.